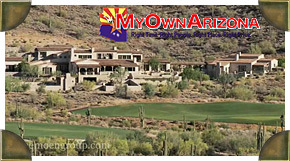 Welcome to the online MyOwnArizona team presentation of Luxury Homes For Sale in Silverleaf Scottsdale. Search our collection of the finest Scottsdale luxury homes, estates, and land for sale in the North area. The City of Scottsdale has some of the finest luxury homes and estates available in the entire country. The Scottsdale luxury real estate market benefits from one of the largest and fastest growing metropolitan area’s in the entire region. The Scottsdale area boasts plentiful luxury shopping, dining, and outdoor opportunities, which are listed for your convenience in our Scottsdale Luxury Resource Guide. Please contact us to receive the luxury packet on Silverleaf Scottsdale. Life at Silverleaf offers both a private resort lifestyle with effortless access to all that the major metropolitan Scottsdale area has to offer. Silverleaf is located only minutes from fine dining, world-renowned shopping, pro and university athletics along with many of magnificent arts venues. If you travel in the other direction, you will find an outdoor lovers’ playground with easy-access hiking, fishing, boating, and camping opportunities. Luxurious homes and spacious yards, along with the top Silverleaf golf course facilities and recreation, are just the beginning. There are nearby Scottsdale schools of all levels, medical facilities, places of congregations at your convenience and Arizona’s national resources, the McDowell Sonoran Preserve. Tucked into the majestic McDowell Mountains of Scottsdale, Silverleaf offers sweeping views in a natural oasis. Silverleaf residents have quick access to nature that will never be spoiled. The open park and local trail system allows Silverleaf residents to travel through the Silverleaf community and the neighboring Preserve to enjoy the sonoran high-desert. Beautiful luxury developments and communities abound within the areas of North Scottsdale. In the heart of downtown Scottsdale you will find urban and upscale lofts with views to take your breath away, and in the surrounding communities in North Scottsdale you will find truly amazing luxury estates. Luxury homes are abundant throughout our area, and MyOwnArizona's North Scottsdale Luxury Homes division has the resources you need to find your dream home. This online resource of Luxury Home offers our clients the best of all luxury to be found in this wonderful area we call home.